Welcome to the D'Angelo Law Library Guide to International Law. 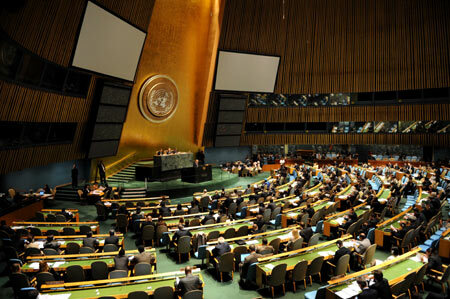 International law is the law that governs relations between nations, making the United Nations one of the most significant organizations in this area of law, but it also includes organizations such as the European Union (which, in many respects, blurs the lines between foreign and international law), the Council of Europe, and many others. It also applies to international conventions, agreements, treaties and all of the areas in which international relationships are governed by the law. This guide is intended to assist in the navigation of international law in its many guises. If you are looking for material on foreign law, which is the domestic laws of foreign nations, please consult our Foreign Law Guide. As always, if there are any questions, please do not hesitate to contact a reference librarian. Given the complex nature of international law, it is helpful to have access to some basic outlines as to its structure. Below are a few of the better guides that will help to get a handle on the nuances of international law. There are a number of guides here that deal with the major touchstones of international law, such as International IP Law, International Human Rights Law, Treaties, the United Nations, and so on. Run and maintained by ASIL. Has excellent, clear layout, with helpful mix of primary and secondary resources. Extremely useful online database that allows for the searching of American case law that pertains to international law. Ideal for determining how international law is interpreted and applied in American courts.